So the World Cup quarterfinals are in the books, and we had four completely different games. 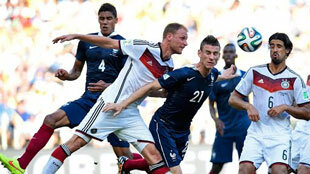 Germany outlasted France, 1-0, not an exciting game but a study in precision football. Hard not to pick the Germans to go all the way. This game proved my theory about soccer only becoming interesting after one team scores; it was 1-0 after fifteen minutes, and it was pretty entertaining the rest of the way. Next Brazil outflopped Columbia, 2-1, scoring a first goal seven minutes in, and then the teams traded goals in the second half. This was a bit disappointing because neither team played their best; it felt like the referee let things get out of control, and the play suffered. We're still waiting to see a brilliant Brazilian side show up, and they'll have to against Germany. And then Argentina outplayed Belgium 1-0, again the only goal being scored early, but this time it led to a bunch of marching up and down the field with no real spark. So so glad my Tivo has a fast forward button. 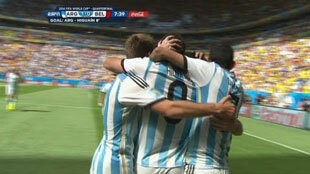 Not even Messi could liven up a dull game, and while the Belgians can play elegant soccer when they want, they didn't. In the final quarter Netherlands defeated Costa Rica 0-0, 4-3, in a game that could serve as a counterexample against my "give one team a goal" dictum. The football was fun and the Dutch certainly controlled the ball and squandered many chances, but in the end it came down to penalty kicks and that was that. If you weren't rooting for anyone you'd have to pick the winner of this team, based on sheer fun, so Go Oranje! I think the Netherlands - Argentina game is going to be quite entertaining. All my picks made it through and I'm stick with my picks for the next round: Germany vs Netherlands in the final.